Global Solar’s SUNLINQ with PowerFLEX technology is a flexible, foldable and durable solar product that produces enough power to charge just about anything that is capable of being charged through a standard cigarette lighter adapter. Folding solar panels are new additions to the solar energy equipments. When the trend came to the market SUNLINQ rigid flexible solar chargerswas one of the first companies to carry it forward. SUNLINQ is available in 6.5-watt, 12-watt and 25-watt foldable solar panels. These modules are suitable for hand-held devices like iPods, cell phones, PDAs and flashlights, but they are not suitable for charging notebook computers which require a minum of 50 to 60 watts. I recomend someone who is considering purchasing foldable solar panels to not go lower than a 25 watt panel. It is my feeling that in this day and age of not enough time, you may be disapointed with the charge times on the lower watt units that are on the market. For those that have the time, this 25 watt charger can be called as a perfect outdoor portable power. It can work with cars, boats and small electronics also but you have to purchase the optional 7-amp charge controller accessory when using the SP25 to charge sealed lead acid batteries or to connect it directly to devices designed to run on 12-volt batteries. 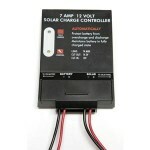 The 7A charge controller add about another $40 to the cost of the system. The SP25 can be connected directly to a Xantrex Powerpack without a charge controller. 1-year warranty.The night time discharge also can be avoided with built in blocking diodes. The durable nylon thin film is also highly efficient feature of this panel helping it to prevent weather related issues. The dimensions of the panel at the open position are 41.25″ x 21.5″. When it is folded, the dimensions are 11″ x 8.25″. The 25 watt charger costs around $399.00 plus the cost of a charge controller of about $40 if you want to use it with 12V batteries.